Today at LifeAsMom, Jessica's recipe swap theme is Freezer-Friendly Meals. Oh, how I love freezer meals! Although I've never quite mastered the whole "Once-A-Month Cooking" thing, I do enjoy making an extra large portion of a meal and freezing some for later. Really, it makes life with two kids sooooo much easier. Southwestern Chicken - This is great when boneless, skinless chicken is on sale. I make a batch of the marinade and distribute it amongst four quart-size ziploc bags with two single breasts per bag. Then I freeze flat and take out early to defrost when I want to use it. What is even better is that my husband is the one who grills it! Then, I usually make up some rice pilaf and a quick green salad. I often serve this to company and they always enjoy it. Chicken Pot Pie - I looked for ages for a good chicken pot pie and experimented with various creations of my own. None of them turned out as well as this version. I made two of them the other week and cooked one right away for dinner and froze the other one. Yum! Chicken Enchilada Casserole - Jessica posted this last week, and it is a good one to freeze. Just thaw it completely and cook as directed. We originally got this recipe from our sister Jamie -- and she likes things SPICY! I don't quite have the tolerance that she does so I don't use the jalapenos. Instead, I usually throw in some salsa for extra kick that doesn't set my mouth on fire. Fill a large pot with water and place your chicken breasts in it. Bring the water to a boil. Cover the pot and turn off the heat. Allow the chicken to stand in the hot water for about 10 minutes. Cut open a chicken breast to make sure that it is cooked through. If it isn't, let it sit a little longer. The residual heat should cook the chicken without overcooking it. 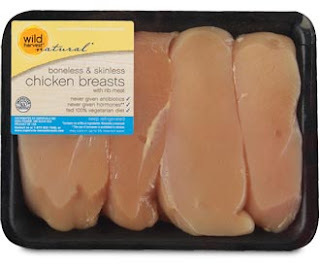 Not only will you get tender cooked chicken, but it saves on energy costs too! Can't wait to explore your site!